This statistic shows a distribution of households in Brazil in 2015, broken down by member composition. 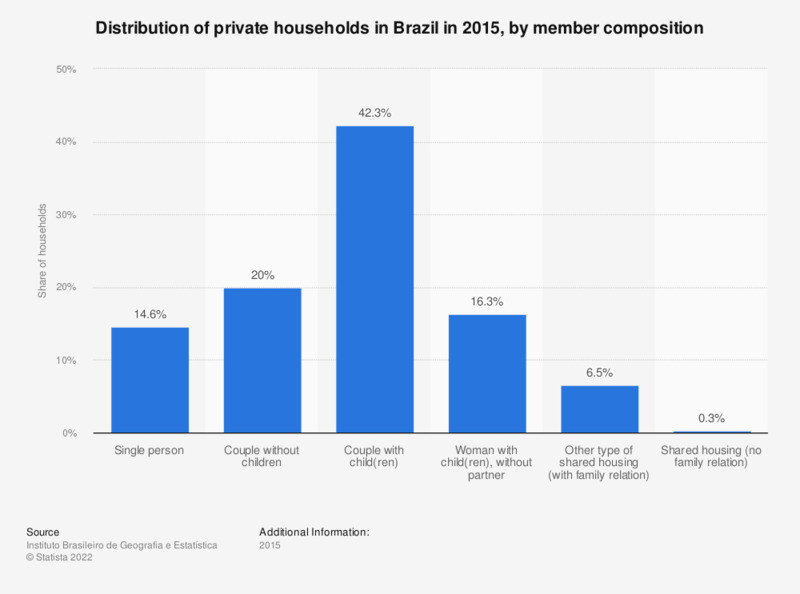 That year, 42.3 percent of private homes in Brazil were inhabited by couples with one or more children, while only 0.3 percent of households were shared among people with no family relation. In total, 71.2 million households were surveyed. What is your opinion of the Mayor of Rome Virginia Raggi? How much do you appreciate the conduct of the Mayor of Rome Virginia Raggi? In Rome there is a waste emergency. Who is to blame? How much do you trust the Mayor of Rome Virginia Raggi? Who is more suitable for governing the city of Rome? How do you judge the work of Virginia Raggi's administration? Compared to her predecessors, how do you judge the work of Virginia Raggi's administration?